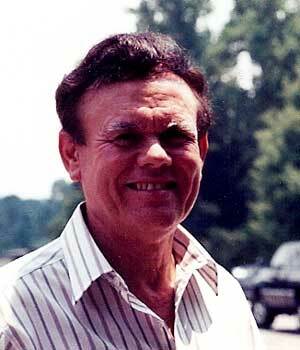 Dan Junior Thacker, 70, of Marion, died Friday morning, January 11, 2008 at the home of his daughter in Richwood. He was born May 11, 1937 in Canada, KY to the late Willie and Ida (Chapman) Thacker. Dan had worked as a supervisor at Pennwalt/Atochem in Delaware. He was once an avid bowler, having bowled a perfect 300 during league play. He loved line dancing, and his zest for life led him to try more extreme activities like sky diving and cliff diving. He was a sports fan, especially of the Bengals and Reds; and was a NASCAR fan. Dan loved the Lord and had accepted Jesus Christ as his saviour. He was loved very much by his family and many friends and will be sadly missed. He is survived by a son, Danny (Dawn) Thacker, Delaware; three daughters, Debra (Kerry) Wallace, Richwood; Connie (Brian) Ankrom, Marion; Karin (Ken) Rishel, Columbus; three sisters, Rosetta Compton, Delaware; Ella Crossman, Phoenix, AZ; Brenda Thacker, Ypsilanti, MI; three brothers, Joe Thacker, Huddy, KY; John Thacker, St. Augustine, FL; David Thacker, Delaware and a host of grandchildren and great-grandchildren. He was preceded in death by 4 brothers. Friends may call from 2 to 4 and 6 to 8 PM on Monday, January 14, 2008 at the Stofcheck-Ballinger Funeral Home, Richwood. Funeral Services will be held Wednesday, January 16, 2008 at 11:00 AM in the Rogers Funeral Home, Belfry, KY where friends may call beginning at 5:00 PM on Tuesday. Burial will be in Church Cemetery, Canada, KY.
May the love of those around you, help you through the days ahead. Praying for friends to comfort you, faith to uphold you, and loving memories to help you smile again. I just wanted to tell Pat, Debbie, Connie, Danny and Karen I am sorry to hear about the loss of your father. Our prayers go out to you. I still love all of you and I remember him and my dad being very good friends watching ball games and hanging out together. This was years ago but I still remember spenging time with your family. God Bless all of you! Linda Lilly and Family Danny, I am glad to have known you and your family as we did spend alot of time together. Time that has stayed with me over many years. I can still see you sitting on the couch in the living room ready for the game to start while Danny and I played marbles. I'll never forget you! :( ALWAYS REMEMBER: At the finest level of our being, you're still with us. We still look at each other at that level beyond sight. We talk and laugh with each other, in a place beyond words. We still touch each other, on a level beyond touch. We share time together, on a level called LOVE. ALWAYS REMEMBER! #4 from: donald compton jr.
Hi debbie,connie,danny jo, i can never remember the babies name, so sorry for your loss, say hi to mom,donald compton jr.